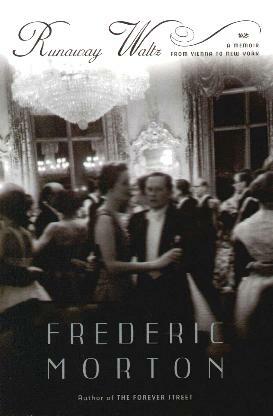 An extraordinarily eloquent and succinct memoir from noted author Frederic Morton. You have to stay on your toes in order to appreciate how this memoir unfolds as it's not clear - it's hinted at here and there. Morton was born in Austria and came to America with his family as a young boy in the late 1930s. Like many others who came to his land, Morton had a name change, as did his early inspiration, in the form of fellow Austrian, Fritz Austerlitz - namely Fred Astaire. Morton's life is an incredible adventure and travel, Christmas with the Rothschilds, skiing fun with the von Karajans, Joan Collins and Anthony Newley, and others. Subtle observations yet sparing many details - he doesn't come right out and say he got married - he alludes to a wife in his life, then later, to a daughter - no "details". This book is a work of literary genius with beautiful words (many I had to look up) and much French and Austrian elegantly tossed about. There's a lot of name-dropping but it's bearable as it was because of writing assignments that this man from Austria via New York, Salt Lake City, and many European cities, came into contact with so many illustrious and influential people. Take care while reading this to be able to fully enjoy his exquisite craft. Conclusion - If you want to read a beautifully written book, this is the one.